The Wangcun Forced Labour Camp is located in Wangcun Village, in Zibo City, Shandong Province. The sections of the camp that are dedicated to holding Falun Dafa practitioners are Divisions 9, 10, 11 and 12. Division 9 is the New Detainee Division, holding the practitioners newly brought into the camp. These practitioners first undergo brainwashing by police officers using deceitful methods. Then they are sent to the collaborators [former Falun Gong practitioners who have gone astray due to brainwashing and torture] in the other divisions for further brainwashing. If the practitioners still do not give up their belief in Falun Dafa, the guards brutally torture them both mentally and physically. 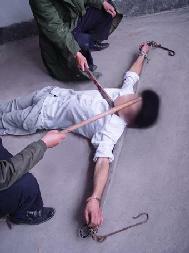 The guards cruelly tortured Li Deshan, a practitioner from Dezhou City, because he would not give up practising Falun Gong. His hands were handcuffed to one bed and his feet to another bed. Then the beds were pulled in opposite directions. The pain was terrible and his body was stretched to the breaking point. Li Deshan died about a year later in August 2002. His death came as a result of these inhuman tortures. He suffered long-term sleep deprivation, brutal beatings, being hung up and beaten, public humiliation, and being force-fed with water and alcohol. The following photographs are reenactments of the tortures experienced by practitioners at the Wangcun Labour Camp. They are based on eyewitness accounts and are reenacted by Falun Gong practitioners in China. In October and November of 2000, the Wangcun Labour Camp called in armed policemen from other locations to torture Dafa practitioners. They handcuffed the practitioners and shocked them with electric batons. Some practitioners were simultaneously shocked with ten to twenty batons at one time. Some were shocked for up to eight hours a day. The odour of burning flesh and the shouts of the police officers could be heard all over the labour camp. Dafa practitioner Zou Songtao from Qingdao City was tortured to death during this time period. In this torture, a long pole is placed horizontally across the back of the practitioner's shoulders and the arms are stretched out and bound to the pole. The practitioner is then forced to lie on the floor, facing up. The eyes must remain open. If even one eye closes, the police brutally strike the practitioner's forehead. This torture is called "Half Flying": The practitioner's hands are shackled to an upper bunk bed. Then one foot is hung up so the other foot barely touches the ground. Some practitioners endured this painful position for 15 days or so. Falun Dafa practitioner Li Deshan, from Dezhou City, frequently suffered this torture. The practitioner is placed between two sets of bunk beds and handcuffed with one hand to an upper bunk bed and the other hand to the opposite, lower bunk bed. The practitioner is forced to lean over to one side and cannot stand up straight. 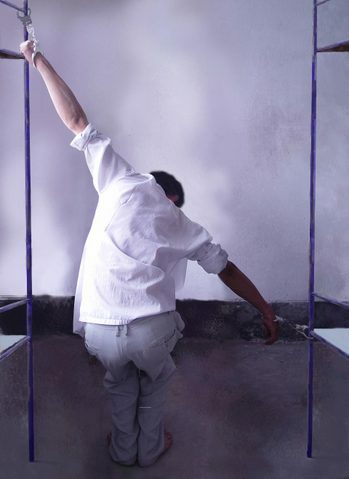 In November 2000, practitioner Li Xinjian had to hold this position or the "Half Flying" position from 6:00 a.m. to 10:00 p.m. daily. Then from 10:00 p.m. to 6:00 a.m., he was tied to the shoulder pole and deprived of sleep. This went on for 27 consecutive days.